This year GlobeScout represent new generation luggage systems at national motorbike exposition Moto Expo 2012. Main innovation on the new generation GlobeScout luggage systems is stainless steel frame system on the body and on the lid of the cases. In Fall 2011 the turkish Dakar Rider Kemal Merkit has contacted GlobeScout for preparing three Rally Bikes for the DAKAR 2012. After the meeting, the team started to design and produce the navigations tower and all the other hardparts, tool boxes, water cans, oil coolers and connections. After a 8 week, the tree bikes was prepared for the hardest rally all over the world. After the rally, GlobeScout team had made detailed inspections on the bikes and confirmed all the parts and systems have survived the rally fully functional. 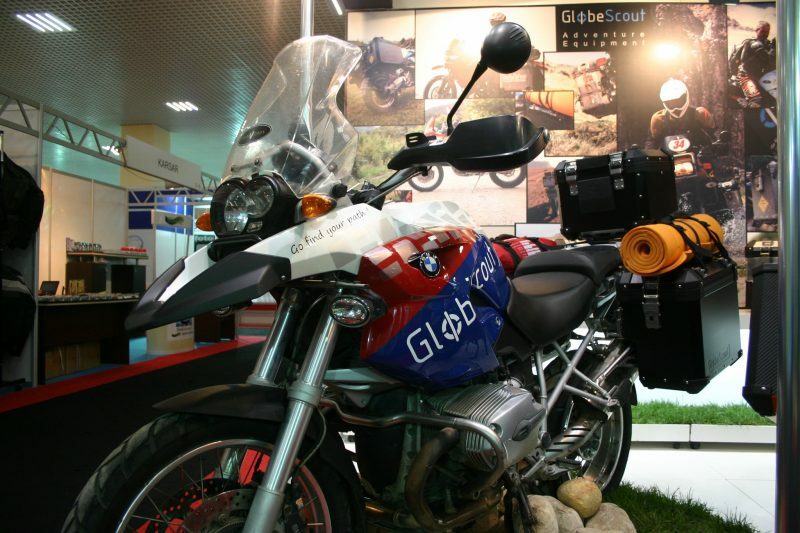 In February 2011 GlobeScout welcome his visitors at the national motorbike exposition named Moto Plus 2011 in Istanbul. Special Side Case system for the BMW R1200GS and R1200GS ADV with exhaust side cutout side case is now in program and ready to order. The Side Case set can be attached directly to the OEM carrier or to the GlobeScout Carrier. The carrier is made of high grade stainless steel tube and welded strongly for your long distance adventures.